A suspenseful short vampire tale of terror. Andy awakes with no recollection of where he is, how he got there, or how long he's been there. All he knows is that it's cold, it's dark, and he's alone. When he finally escapes, he encounters strange, supernatural creatures. Terrifying monsters of the night. Thinking of his daughter, Emma, his only goal A suspenseful short vampire tale of terror. Thinking of his daughter, Emma, his only goal is to get home and make sure she's okay. A 3,000 word story, perfect for any fan of suspensful horror and monstorous vampires! A nice little horror story. I found this tale to be very intriguing. I wasn't sure where it would end up. I personally loved how the author gave us information in short pieces, slowly bringing us into the scene, into the horror. Although a short story, the characters were well developed, and this was done quickly. A nice read for horror fans. Also, even in the end, we still don't get a definite answer as to what the creatures are. I love that element of mystery. A horror story that leaves some que A nice little horror story. What a surprising ending! A man walks up in a cemetery mausoleum. He's confused and has no clue how he got there. He instantly remembers his daughter alone at home and struggled to escape the stone prison. He hears screams outside as he is climbing a wall and then sees a man with blood dripping down the side of his mouth and a body to the side of him, a young man with s chunk of his throat ripped out. What happens next? I'm not telling. 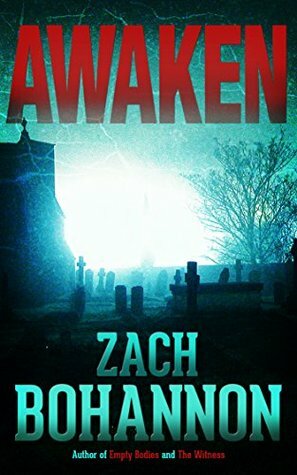 I enjoy horror short stories with a twist, and Awaken didn't disappoint. Nice blend of action and atmosphere. An enjoyable read. This book was suspenseful, but it was too quick as before I knew it, the book was finished. Wish it had been just a wee bit longer, but it was still a good read. A man wakes up in a cemetery with screaming all around him and as he tries to make his way home to his daughter, he has to literally run all the way home as there are vampires everywhere. Three stars for this one. Bohannon give me more of your stuff! This is a wonderful short story with a simple enough plot, a Father looking for his daughter in the awakening of vampires attacking the town. This short story is really well written, and the gore is pretty non descript - it's nice to see an author choosing more shock horror and plot twists in a story like this rather than relying on the gore horror aspect. I love how Bohannon has described the vampires in this, a vivid image in my head at the horrors that haun Bohannon give me more of your stuff! This is a wonderful short story with a simple enough plot, a Father looking for his daughter in the awakening of vampires attacking the town. This short story is really well written, and the gore is pretty non descript - it's nice to see an author choosing more shock horror and plot twists in a story like this rather than relying on the gore horror aspect. I love how Bohannon has described the vampires in this, a vivid image in my head at the horrors that haunt the night. The plot doesn't seem rushed at all, and the plot twist in the story was stunning and made me jolt a little. Didn't give me anywhere near a scare. Quick little Halloween read with an interesting twist! I thought I'd try a few of these 15 minute reads from Kindle to see how they compare quality wise to other short stories I've read. Sometimes a long novel can leave you empty, and in some cases they can be a waste of time. However, some short story (if well written) can has a lasting effect on your mind. This short story did just that. I gave it 4 stars because it was not clear to me how he got in the mausoleum. Who placed him there? He had asked the question, but it was never answered. Maybe the author did this on purpose? Leaves the reader hanging.with out any resolution or a ending of any kind. Would love to read a better ending. The author is very talented in the writing of the story lots of detail and good start to story. Short story but a nice one. Andy wakes up in a strange place his only thoughts how did he get there and he has to go home to his daughter. He meets creatures of the night along the way but he has to go home to his daughter. You'll have to read it to see. Overall I thought this was a good book. I thought it was written well, but to say it was a short horror story, it wasn't scary at all. It's not what I would call a scary book, but it was still a good read. It was still a good read and I would read this again someday. Well-written, suspenseful short story that keeps you turning the pages. Enjoyed the twist at the end though my suspicion about the main character was confirmed beforehand. Quick read. Wish it had been longer. Great horror story! Looking forward to reading the author's other work. Great story well written. Had me guessing. Wish a Lil longer. . . ... . . . . .
A pretty good read. You are immediately pulled into the story and the writer keeps you constantly guessing on what is happening. Although this short story wasn't that scary, it still was a good read. Quick and entertaining with a twist at the end. Excellent writing and appropriately creepy. I don't usually like short stories, but this was pretty good. Looking forward to reading more from this author. A brief but very effective vampire story, with a great twist at the end. I definitely want to read more by this author. Haven't Read a good graveyard story in along time.very enjoyable. I wasn't sure about this book. I was happily surprised at how good it is. It is far too short, but a fun read. This is a short story. Even for a short story it is short. I am known to have a short attention span, so I love short stories. I have said that many times (and as I get older I am becoming more and more like my nonna and tend to repeat myself so expect to hear that again ad nauseam). As with anything, some stories are good, some are bad and some are just eh. This one, for me, was a good one. It starts with a guy waking up in a mausoleum. Your typical spooky creatures of the night chasing you scen This is a short story. Even for a short story it is short. I am known to have a short attention span, so I love short stories. I have said that many times (and as I get older I am becoming more and more like my nonna and tend to repeat myself so expect to hear that again ad nauseam). As with anything, some stories are good, some are bad and some are just eh. This one, for me, was a good one. It starts with a guy waking up in a mausoleum. Your typical spooky creatures of the night chasing you scenario plays out as your main character tries to get back home to his daughter. He gets home and then there is a twist. It’s not a M. Night Shyamalan The Village twist but a M. Night Shyamalan Sixth Sense twist (you know, the one movie where the twist was almost actually clever). Granted, the twist isn’t exactly a surprise, but fun nonetheless. This isn’t why I enjoyed Awaken though. What I liked about this story was all of the questions left unanswered. Here we have just a small snippet of a larger picture. The little tidbit that Bohannon gave us left me wanting more. If you have 5 minutes (at the most) and want an interesting vamp story, I say give Bohannon’s Awaken a go. A 3,000 word story, perfect for any fan of suspensful horror! Because it's a short story, it's difficult to say what this story is about without giving anything away. This review has been hidden because it contains spoilers. To view it, click here. I enjoyed the story idea, it's solid. Maybe not the most original story idea ever, but it's solid. But the story itself was lacking. Firstly, and worstly, the title gives away the ending. I knew from the start that the guy was a vampire. This could be forgiven if the writing was better and more character driven. Secondly, there is a lot of telling and not much showing. Yes I understand that he is a single father and feels guilty about the wreck that killed his wife and son. Now show how it tears I enjoyed the story idea, it's solid. Maybe not the most original story idea ever, but it's solid. But the story itself was lacking. Firstly, and worstly, the title gives away the ending. I knew from the start that the guy was a vampire. This could be forgiven if the writing was better and more character driven. Secondly, there is a lot of telling and not much showing. Yes I understand that he is a single father and feels guilty about the wreck that killed his wife and son. Now show how it tears at his insides. While it doesn't take a genius to figure out what's going on pretty much immediately, Zach Bohannon does a great job of spinning an entertaining thread for the reader in an easy-to-read, instantly enthralling fashion. This is a well-done story of a love that overcomes monstrosity, and one that is (if you've ever been a parent) not unbelievable. Plus, the vampires don't sparkle. That's always a plus. Visit Scifi and Scary's Book Reviews for many other Science Fiction, Horror, Thriller, and Kids' B While it doesn't take a genius to figure out what's going on pretty much immediately, Zach Bohannon does a great job of spinning an entertaining thread for the reader in an easy-to-read, instantly enthralling fashion. Visit Scifi and Scary's Book Reviews for many other Science Fiction, Horror, Thriller, and Kids' Books reviews.